Promote awareness of World AIDS Day, which is December 1, 2015, to your community with these simple and informative resources. Wear a red ribbon on December 1, 2015. Watch and share this World AIDS Day awareness video, and use #WAD2015 and #HIV. 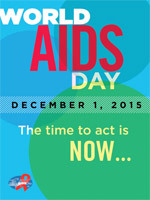 For more information, posters and media campaigns, visit AIDS.gov. Get started with CARE|Connect and promote World AIDS Day and your specialty at retail practice to the physicians in your community. Target Infectious Disease practitioners and Internal Medicine physicians with a sub-specialty in infectious disease. You can search online for HIV/AIDS doctors or visit AIDS.gov and search testing sites and care locations. For more help in targeting specialty doctors: Sign up for McKesson “POP” Physician Outreach Portal.